IPM / Biological control - National Agrochemical Distributors Ltd.
Click here to read article about FliPPER on the Growtrade.ie website. A bio-fungicide containing a naturally occurring hyperparasitic fungus for reducing powdery mildew on protected crops of aubergine, courgette, cucumber, melon, pepper, pumpkin, tomato, strawberry, and winter squash. A parasite of, and active against a wide range of powdery mildew species. Naturally occurring fungus with a zero harvest interval. PRESTOP® is a unique, patented and approved bio-fungicide which contains the mycelia and spores of a naturally occurring, highly aggressive, soil-borne fungus (Gliocladium catenulatum fungal Strain J1446) which survives in the root zone and on the aerial parts of plants for several weeks, and capable of providing a number of very useful disease control benefits to a wide range of cropping situations. To learn more about Prestop, please click to download general information and click here for the product label with rates. Black Vine Weevil (Otiorhynchus sulcatus) is a major pest of nursery stock, pot plant and soft fruit production. Leaf notches around the edge of leaves indicates damage by adult weevils, this is when egg laying begins between June and October (but over a longer period under protection). To learn more about Nemasys-L, the biological control of Black Wine Weevil larvae, please download the article here. 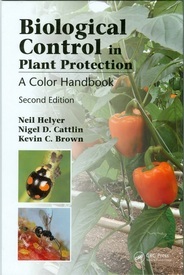 This guide covers the life cycle of the pest, monitoring for it, vulnerable plant species and all forms of chemical, biological and cultural controls. On nurseries that suffer high Vine Weevil pressure, only an IPM programme comprising multiple strategies is likely to be effective. Please click on the image to download an updated copy of this booklet. A versatile bioinsecticide for the control of whitefly and the reduction of thrips in all protected edible and non-edible crops. Please click on the image to download the new, comprehensive product leaflet. 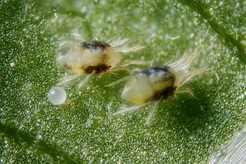 The red or two-spotted spider mite is a major pest of almost all protected and some outdoor crops. At this time of year as environmental conditions are at their hottest and driest, populations of the pest can develop quickly and cause significant damage. Read the complete article on red spider mite control here. The colour handbook is designed to help the reader anticipate and recognise specific problems of pest management and then resolve them using the natural enemies of pests - insects, mites and diseases.